‘Westworld’ is a dark odyssey about the dawn of artificial consciousness and the future of sin. The one-hour drama features actors Anthony Hopkins, Ed Harris, Evan Rachel Wood, James Marsden, Thandie Newton, Jeffrey Wright, Sidse Babett Knudsen, Rodrigo Santoro, Shannon Woodward, Ingrid Bolsø Berdal, Ben Barnes, Jimmi Simpson, Clifton Collins, Jr., Simon Quarterman and Angela Sarafyan. 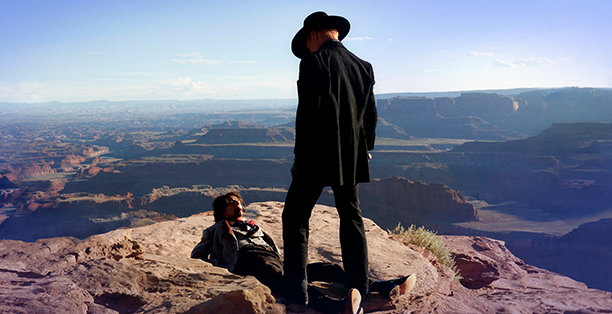 ‘Westworld’ is inspired by the film of the same name, written and directed by Michael Crichton. This entry was posted in Trailer, TV and tagged Angela Sarafyan, Anthony Hopkins, Ben Barnes, Clifton Collins, ed harris, Evan Rachel Wood, HBO, Ingrid Bolsø Berdal, James Marsden, jeffrey wright, Jimmi Simpson, JJ Abrams, Jonathan Nolan, Jr., Michael Crichton, Rodrigo Santoro, Shannon Woodward, Sidse Babett Knudsen, Simon Quarterman, Thandie Newton, Westworld. Bookmark the permalink.